We had the opportunity to ask some questions of Susan Sauvé, Transportation Demand Management Planner for the City of Peterborough. 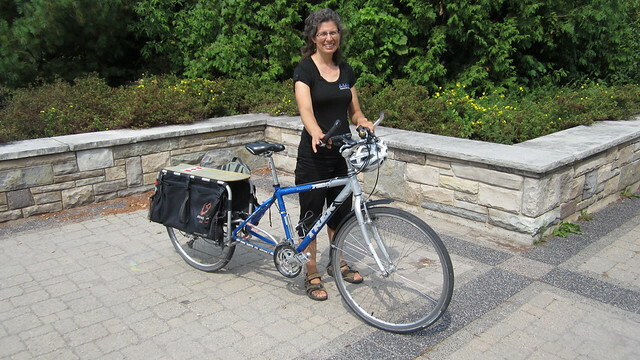 Susan is an active cyclist and a very familiar face at many bike events, especially those put on by the City or its partners (some of us affectionately know her as “the City Bike Lady”). 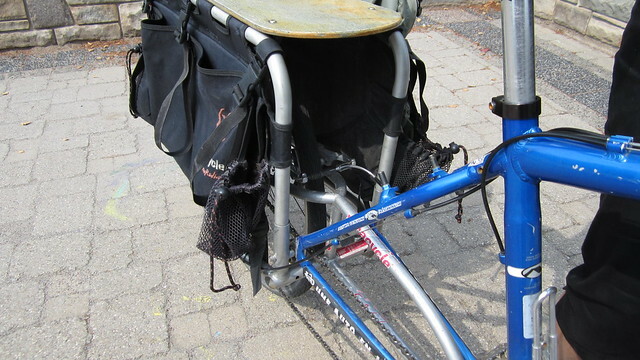 After a chat at the Silver Bean Café, we also got a chance to get a close up view of her very recognizable Trek-Xtracycle LongTail cargo bike. Q: Your official title is “Transportation Demand Management Planner” for the City, yet you seem to be involved in most bike-related events that have a City connection. What does your position deal with and how much of that is bike-related? Improve the infrastructure that supports cycling and walking. Assist in the improvement of public transit services. Through programs that support a shift to walking, cycling, carpooling, transit or working from home, such as the Shifting Gears Workplace Transportation Challenge. Through research and experience, I have found that walking and cycling are the most popular transportation choices for people choosing to drive less. Therefore, I put lot of effort into improving the infrastructure for walking and cycling, including sidewalks, trails, on-road bike facilities and bike parking. Q: The city has made great strides in improving bike-supportive infrastructure (most recently the downtown parking racks). Where do you see the city moving next to further improve things? The 2011 Transportation Plan Update provides a comprehensive framework for expanding the city’s bikeway network. Our focus in the short and medium term will be to implement the projects identified in that plan. This includes both on and off-road infrastructure. Q: What do you see as the biggest roadblocks to increasing bike ridership and creating an even better bike-friendly City? One of the biggest roadblocks is the level of staff available to work on cycling infrastructure projects. There are many pulls on staff time and the nature of these project is that they tend to be time consuming. There is always a lag between the planning for and the implementation of projects, so you will likely see many improvements roll out in the next couple of years. Q: How can the wider cycling community in Peterborough help improve things? Ride your bike! Seeing cyclists using facilities that are provided is the best way to keep support for new cycling facilities alive. Every year, there are several opportunities to comment on road projects, cycling projects and trail projects. Take the time to look at what is being proposed and comment on it. Commenting on transportation plans and related planning documents such as the Official Plan is important too. Q: How do you integrate bikes into your personal lifestyle? 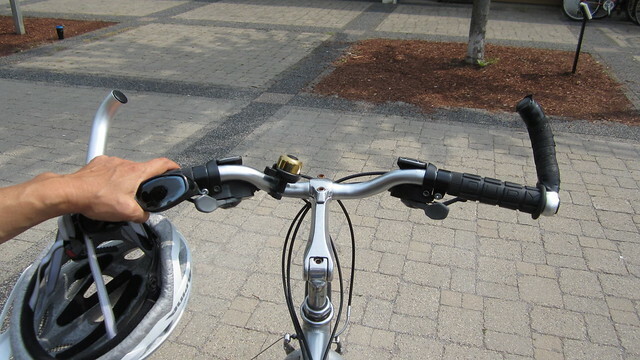 I use my bike for most in-town trips and for recreation as well. 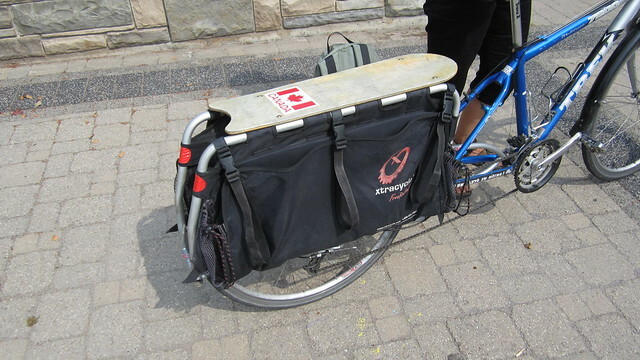 I have a hybrid bicycle that I have turned into a cargo bike by adding an xtracycle free radical to it. This allows me to carry more stuff more easily. I also have a Cannondale touring bike, but I usually prefer my hybrid. Q: If the great cosmic bike spirit offered you your dream ride, what would it be? I had a chance to do some riding in Europe in 2010, and I would love to do more riding in France. Q: What is the number one reason you ride? That’s a surprisingly personal question. I was diagnosed with a degenerative eye disease at the age of 8 and was told that I would never be able to get a driver’s license. Fortunately, the eye disease has been beat, but I have never wanted to be dependent on a car in case my vision diminishes. The bike provides me with a sense of freedom and independence that I do not get with a car. Also, I like to wander further afield on a regular basis than my feet will let me. My other interest in riding comes from a deep commitment to living a sustainable lifestyle, and riding is one way that I do this. Q: What sort of cyclist would you say you are? I would say that I am a casual, but very committed cyclist. 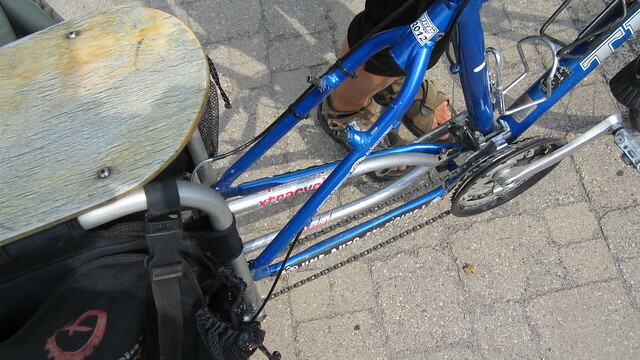 Q: What do you like best about the Peterborough Bike Culture? There is a genuine interest in what is new and an underlying support for each other. Thank you so much for taking the time to talk to us and our readers! You can find out more about the 2012 Comprehensive Transportation Plan Update here (scroll down to mid-page). Great article James! Thank you for interviewing a champion in bicycle culture in town!